Enjoy our chef-created buffet display while delighting in the spectacle of lighted holiday boats from the comfort of our waterside terrace dining area. Admission is $69.95 per adult and $24.95 per child (age 12 and under); tax and gratuity are not included. First, join us on the PIER 22 terrace where you will be greeted with a celebratory glass of champagne (adults 21+) and where a mouthwatering buffet of tempting housemade offerings awaits. A cash bar and our complete drink menu are also available (not included with ticket price). As the procession of brightly decorated boats passes by (approximately 8:30 p.m.), VIP guests receive front-row seating for the duration of the parade. 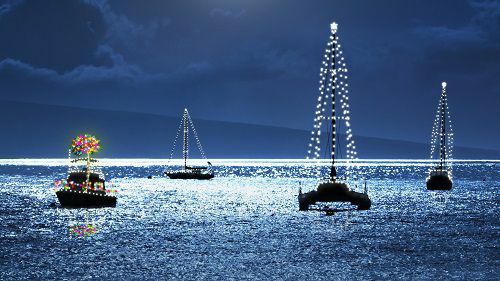 Designated an official Holiday Boat Parade judging stop, guests are encouraged to applaud and cheer on their favorites. Officials keep score based on criteria such as creativity, spirit, musical entertainment and crowd reaction. Please note that this is a single seating event starting at 6:30 p.m. and ending with the parade finale around 10:00 p.m. Due to the popularity of the VIP Boat Parade Viewing Party and to best serve all of our guests, the VIP party requires advance reservations and a credit card hold. Your credit card will not be charged before you dine with us unless you either do not show up for your reservation or you cancel without 48 hours notice. Terrace seating is covered, and this is a rain or shine event. As long as the river is safe for boaters, the show will go on! Covered patio seating is first to come and first to be served. However, we highly suggest making reservations for inside restaurant dining, but please be aware that PIER 22 cannot guarantee that inside diners will be able to view the parade from their seats.